The best thing about a rice cooker in the summer is that it doesn’t heat up your kitchen! All hail rice cookers! I modified this recipes from Molly Katzen’s Moosewood Cookbook, my college bible. 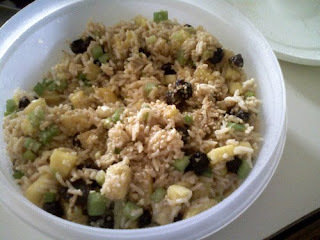 She credits Sri Wasano for this Indonesian rice salad. I prefer dishes with as few ingredients as possible for 3 reasons: 1) I’m lazy 2) I rarely have *that* many items already handy 3) my palate gets confused when I have lots of ingredients to filter, sort through, identify. I just want to eat and be sated. So this is my pared down version of this almost-no-cook dish. In a rice cooker, measure 1 part basmati rice to 2 parts water. Press cook and do the other stuff. Combine these in a large bowl. When the rice is done cooking, scoop the rice into the dressing bowl. Coat well. Then fold in the veggies and fruit. Add 1/4c raisins. Sprinkle with gomasio or sesame seeds for a little extra protein. Eat warm or cover tightly and chill. I like it warm. Note: Pineapple has this weird way of cannibalizing other food around it, so eat this dish within 3 days.